I'm creating a new Club for BG because I think it's lacking a weapon for my evil Cleric/Thief (assassin). Most clubs are stout, hardwood sticks, narrow at the grip and wider at the end. This one is very light weight and slim, so it’s easy to handle but can’t do much damage. Only the metal pieces in it, make it appear dangerous. Anyone can find a good stout piece of wood and swing it; hence the club's widespread use. A Loviatan priest from the Resting Place of the Whip in Melvaunt created the Barbed Club of Pain to use as an offhand weapon beside his whip. It was used as a reward for an allied Bhaalist assassin who fulfilled a mission for the temple. Since then the Barbed Club of Pain was used for several assassinations and always left distinct marks on the dead, cold bodies. While not efficient for one-hit backstab kills, a successful hit with this club lets victims to be overcome by excessive pain and critical blood loss that can eventually lead to their demise. In contrast to most other clubs, this weapon is crafted from a simple thin stick. Its slim size and low weight makes the club easy to handle and allows for dangerously precise maneuverability. Numerous metal barbs grew out of the wood, carefully created through the priest's magic and Loviatar's fell blessing. With every strike sharp barbs dig into the victim's flesh, causing extreme pain and even extra damage that continues for some time after the blow. Damage 1d4 +1, +3 bleeding damage/round, lasting two rounds. Cold iron or silver for greater werewolfs/wolfweres? Loviatar and Malar are Allies so not likely. 1d4 why? Because it will easily become a very overpowered weapon. It’s now a lightweight stick, instead of a thick club. +1 Thac0 an damage why? Because it’s easier to handle (like the masterwork items in IWD) the +1 damage will maybe get lost if it’s to overpowered. Alignment restiction: is it used on any weapon? I think not. Loviatar will be pleased if an Ilmateri priest uses it. Where to place it? Maybe an encounter with a priest? Firewine, Ulcaster? Update 1.3 Damage fixed (no more poison)! Loviatar? Barbed?? Club?! You, sir, have my full attention! "A Loviatan priest from the Resting Place of the Whip in Melvaunt created the Barbed Club of Pain as an offhand weapon beside his whip. The weapon was later given to an allied Bhaalist assassin as a reward who, unbeknownst to himself, fulfilled a mission for the temple. Since then the Barbed Club of Pain was used for several assassinations and always left distinct marks on the dead, cold bodies. While not efficient for one-hit backstab kills, a successful hit with this club lets victims to be overcome by excessive pain and critical blood loss that can eventually lead to their demise. In contrast to most other clubs, this weapon is crafted from a simple thin stick. Its slim size and low weight makes the club easy to handle and allows for dangerously precise maneuverability. Numerous metal barbs grew out of the wood, carefully created through the priest's magic and Loviatar's fell blessing. With every strike sharp barbs dig into the victim's flesh, causing extreme pain and even extra damage that continues for some time after the blow." Personally, I don't think it's really immersive to allow Good aligned characters to wield this weapon. Most of them would probably find it... distasteful... to equip something like this. Just like the Human Flesh Armor. I'm not sure about possible locations for this club though. Given its special properties, it should be in a place where low level parties shouldn't have access... the Bandit Camp, perhaps? But I imagine that would probably be not compatible with your upcoming quest. Or, wait! I *think* I do remember that there was something akin to a torture champer within the Cloud Peak Mountains in Rasaads quest? Something like this would be a likely location for an encounter with Loviatar's faithful. There are only a tiny few weapons who are alignment restricted. But its on my consideration list. I will change my description with your input. And maybe I will lose the +1 damage if it's overpowered. Maybe I put it somewere around firewine. The club is ready for clubbing But still in BETA. I used Weidu 236 so its easy install. And if someone can check if i messed some things up in the .tp2 or .itm ? This is my first mod so I like to hear your comments. On my to do list are the grapics. On my wish list is creating a small quest. @CrevsDaak‌ thank you very much. I will fix that, there should be only one copy. This week I will try to create new BAMs, so it will look special. The Club is Compatible with V1.3. And version 0.3 is almost ready. At this time I only have trouble with DLTCEP, I cannot save re-colored BAMs. I have made some new BAM's and recolored some clubs. And Recolored the ingame animation color! V1.0 is ready, easy install, new names with Prefix S3, new BAM. Please post all problems in this topic! The new version is ready Update 1.1 Melee BAM's corrected! The new version is ready Update 1.3 No longer says Poison damage! Loviatar is a very happy penguin. Confirmed working on the update since SoD. Very nice and useful item. I translated this mod in Italian. Can you please add the translation to your mod? Yes @Aedan I will do that. I will make it a lesson Italian for myself. I have to practice for my vacation in July. If anyone makes a traslation, I will ad it to my mod. Thanks for the mod and for adding the Italian translation. @Aedan and/or other Italians can you check if the Italian translation works. I'm at work and don't have BG installed on my work laptop. Can you please do a quick test and check if the Italian translation of the club works fine? I installed the mod with success, but the game crashes to desktop when I try to check the halfling's store. @Aedan check if encoding is correct. I believe it should be UTF-8 (without BOM). It's an encoding issue. Both tra files (English and Italian) are ANSI instead of UTF-8. The easiest solution would be reencoding them in UTF-8, but that would break compatibility with non-EE games. @artificial_sunlight, I took the liberty to do these changes for you in the attached modified version of the mod. The new version is much larger (5.5M) because of the iconv folder. If this is an issue, I can show an alternate method that it is a bit less straightforward, but it does not require to include iconv in the mod. It works like a charme now. Thank you, @Erg! I noticed a small typo that I fixed (THACO is wrong; the right word is THAC0). Attached the updated translation. @Aedan I was sleeping! It was 4 AM when you sent me the message, sorry! "ha sempre segni distintivi sui freddi cadaveri" doesn't make sense. Should't it be "ha sempre lasciato". "e il suo leggero peso"... works in english, in italian I'd switch the position of the adjective: "e il suo peso leggero". "Dalla maglia del sacerdote". Che sacerdote? Quello che l'ha forgiata? Thanks you all, I created the files in Notepad++ and they worked. But today I edited them with the normal Notepad in Windows so I broke them. I will fix the mod (or use your fixed version) and upload the New version. I will fix the mod (or use your fixed version) and upload the New version. Feel free to use the code I've posted, if you want. You don't have to credit me for it, credit for both the implementation of HANDLE_CHARSETS in WeiDU and the sample tp2 code shown above should go to Wisp. to avoid crashes on BG:EE+SOD. Until then, you should be fine (i.e. no crashes) on BG:EE+SOD, because current WeiDU (v239) still treats SOD like BG:EE. I think this deserves a separate stickied thread. Otherwise it'll be buried eventually uder following posts. Perhaps you can add this useful info in this thread? I've installed the mod; what store can I find it in? 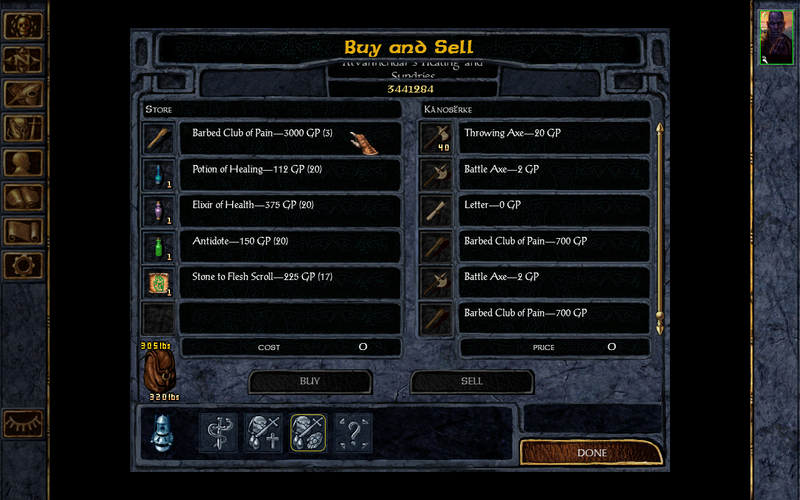 Playing BGEE at the moment, not BG2EE. Thanks! I can't seem to find the readme. There is no readme file in any of the folders that the mod's install created, nor is there a readme in the main BGEE folder nor in the Doc's folder where I have all my saves and portraits etc.